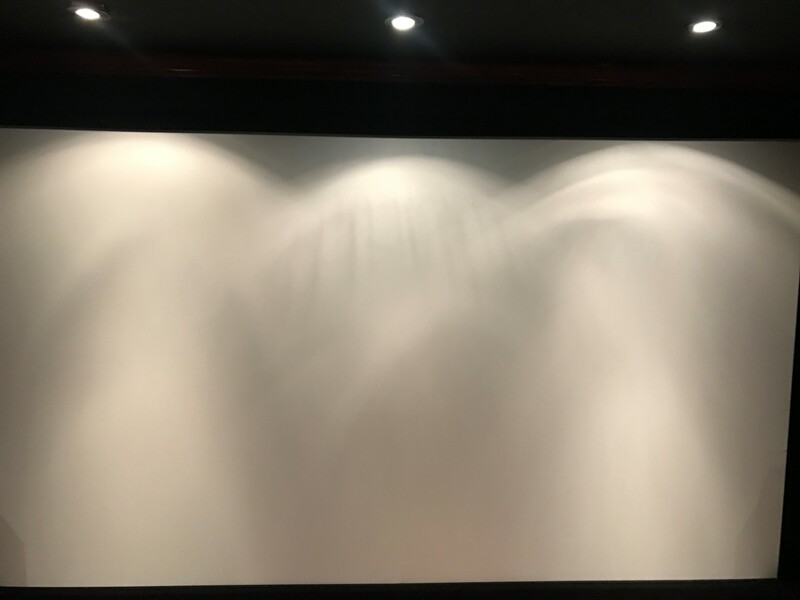 When building your home theater, one of the issues that comes up when finding a projector screen is “which one to buy”? Or should I even buy a screen at all and just paint a wall instead? I’ve done the painted wall, the painted canvas, and a store bought screen, so I’ve got a pretty good perspective on all of them. I’ll try and give you a rundown of my opinion of the best home theater screens. Even after all this, it’s still probably going to cost you $100 in materials and 5 to 10 hours worth of time, so it’s not totally free. If you want to go super cheap you can ignore the border but it won’t look very good. 10 years ago, I would have recommended this for sure. At this point though, I think there are better options for slightly more money and a lot less time and effort. 10 years ago, cheap fabric home theater screens were either portable ones on a stand or DIY ones where you bought several hundred dollars in material and made your own screen. Luckily, there’s now a lot better option, and it’s what I have in my home theater as well. I had a painted wall before this, and this is WAY better than a painted wall. For the money, it just crushes the painted wall option. I don’t think I’d ever do a painted wall again with this available to buy. Before this came out, almost all the screens were $500 to $1000, which made it very hard to justify when a wall costs $100 and gets 80% of the way there. This though gets 100% of the way there and costs only marginally more than the painted wall. Once you get over $500, you get into what I like to call high priced home theater screens. Maybe to some people this isn’t high priced, for someone like me who’s always looking for a bargain, this isn’t my category. Usually the players in this category are like Stewart, Da-Lite, Elite Screens, and some others. It has a tons of high reviews, so they must be doing something right. Myself personally, I’d rather save the money for something else, but if you think about it you usually keep the same screen forever while the projector changes out every so often, so maybe it makes sense to spend more on a screen up front? I don’t think you can really go wrong with any of the options. A lot of people start off with the painted wall, then go to the cheaper screen, and then to the more expensive one. I personally don’t see myself going off the cheaper screen because of how much I like it, but maybe someday something will come out that will make me change my mind. Hopefully this guide has been helpful, and good luck in your search for the best home theater screen for your home. Should I buy an expensive TV?